Nutrition. My worst enemy. As I confessed during the holiday season last year, I struggle with eating properly, which is a huge hurdle for many people. I grew up on junk food back when I was a child and had a much faster metabolism and hours of sports practice each day. My weight always managed itself – until I was no longer a full time athlete and started struggling to maintain the body image I had grown to accept as a given. Part of the reason I started running and teaching fitness classes was to combat the encroaching weight gain. My levels of activity are definitely going back up, but my metabolism is still slowing down with every birthday, and I know that workouts alone are not the full answer to the problems I’m facing with weight management. I need to do better about eating. Thankfully, I’m not alone in my quest. I have supportive people all around me who are encouraging me to make better food decisions and acknowledging my successes to remind me that the hard work is paying dividends. I have a big network of acquaintances, bloggers, and fitness fanatics who are facing the same struggles and sharing their experiences so other can learn for their own battle. And now, I also have a supplement that is supporting my goals without slapping me across the face with side effects. Appetite suppressants have never been something I thought would be a successful addition to my cabinet. Most of them contain stimulants like caffeine (I’m highly caffeine-sensitive) and supposedly work through thermogenics (increasing heat in the body to burn energy), and I’ve always thought of them as kind of a crock. I’ve even tried a couple in the past that did nothing for my weight, yet threw so many adverse side effects at me that I had to toss them in the trash before my health suffered any further. REDEEM, on the other hand, had a noticeable effect on my weight with no unwanted side effects, and it only took a week or so for results. Now THAT is something I can get behind! 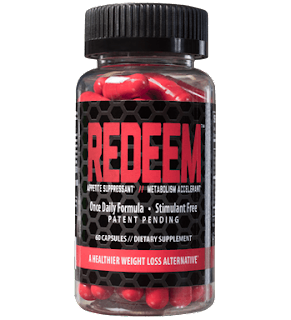 REDEEM is stimulant-free and contains ingredients your body actually needs to function, such as thiamine and other B-complex vitamins that help you fuel efficiently. I started taking REDEEM and at first questioned that it was doing anything at all. After a couple days, though, I noticed I as already doing a little better with food amount choices – such as stopping earlier in a meal instead of shoving more food down my throat thinking I was still hungry. My overall calories slowly started to decrease, and after a couple weeks I had noticeably lost weight! To be honest, I was pretty surprised to find myself not only eating less, but considering more carefully which foods I would eat when I started to get hungry. After a few weeks of consistent use, I felt much more confident in my nutrition decisions and my ability to say NO to more food when I had eaten enough. So far my weight loss has been roughly seven or eight pounds, in a couple months, which is perfectly healthy for me – not that those numbers are even reflective of the total change that has come from REDEEM! I’ve also been running much more and building additional muscle over that time, which has actually added muscle weight, so my overall fat loss is much more than the pounds that have come off the scale. 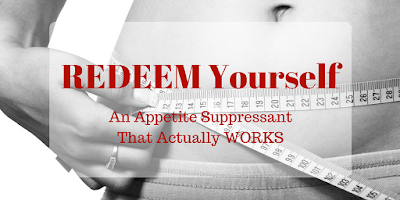 I’ve leaned out noticeably (and have received many compliments on my figure lately) which is almost completely attributed to my food successes since starting with REDEEM. Though I still occasionally give in to cravings or overindulgence, on the whole my relationship with food is becoming much more healthy. Rather than using REDEEM as THE plan for weight loss, I am able to use it as a true supplement in a more self-aware nutrition plan. It’s not the solution, it’s a guideline for keeping on track. I don’t feel dependent on it, either, and have actually gone off it for a little while to test how effective my decision making is without the supplement influence. I do waver a bit more when I’m not taking REDEEM (especially when the cravings hit), but I definitely continue trending towards healthy now that I’ve proven to myself that I CAN do it! The chemical support of REDEEM just helps me continue to grow and build better habits, and I’ll be keeping a place in my supplement cabinet for it for sure! The personal nutrition marketplace is HUGE! Supplement Sunday is designed to help you navigate the many options with which you can, well, supplement your nutrition, your fitness, and/or your weight loss goals. 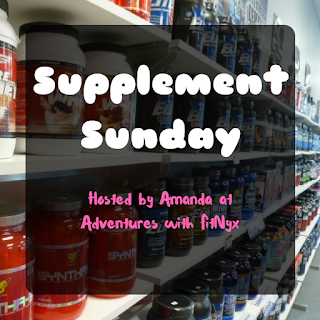 Check back every Sunday for another list of powders, pre-workouts, vitamins, and other nutrition options!